The latest version of Weihrauch’s first PCP rifle now sports key features demanded by the US shooter. The first and most obvious is the attached moderator, which reduces the muzzle report down to a quiet “puff”. The other improvement is the quick fill feature on the air cylinder as well as the built-in pressure gauge on the front of the air tube. Rather than having to remove the air tube to refill, you can insert a fill probe to the cylinder and recharge with your fill device, and the internal pressure is displayed with a color coded gauge. These improvements make the super accurate HW100 even better than previous models. Along with a match grade sporting trigger which is both predictable and crisp with 2-stage adjustments, the HW100 sports a silky-smooth side lever bolt that is both convenient and nearly effortless. 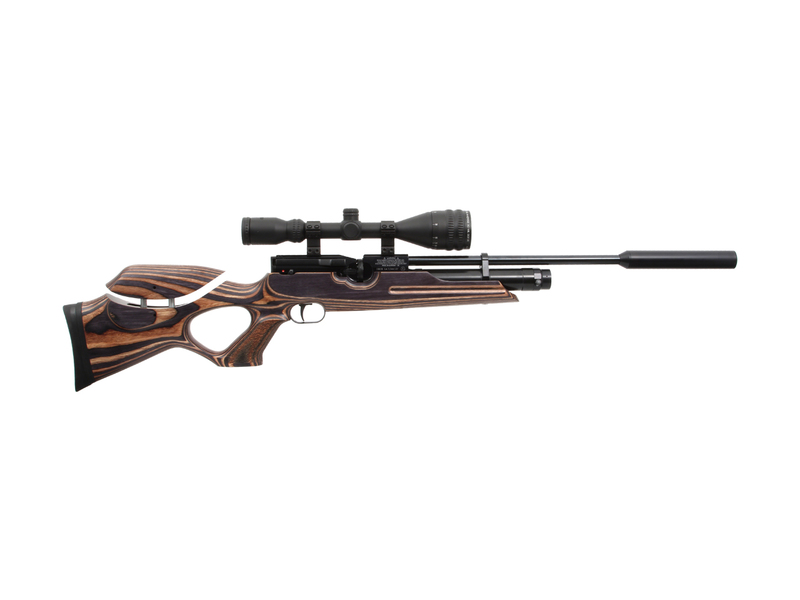 The rifle is matched to a quality laminate stock that has an ambidextrous design. And it feels as good as it looks, and is comfortable for both sporting and target applications. Top it all off with the magazine fed repeating mechanism (with single shot option), and you have a fine, German-made air rifle to compete against anything in its class.